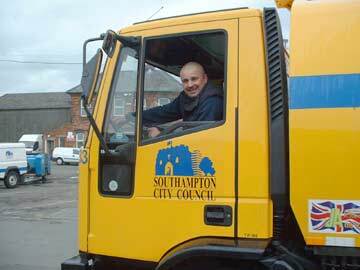 Simon Craz-Barnes is one of the long-time sweeper operators in Southampton, and I had the pleasure of sitting next to him at lunch. During our visit, one of the other operators made a comment about a situation that had befallen Simon while driving. It took a bit of prodding, but with the good-natured smile that seemed a permanent part of Simon's character, he retold his tale. "I was sweeping a slipway [a boat-launch constructed of a relatively steep strip of concrete leading down into the water]," laughed Simon, "reversing backward down toward the water. It started raining and I just slipped off the edge. It was quite a deep drop, and the lorrie [sweeper truck] turned over. There I was, on my side in the truck, even though the donkey engine kept going. "I got out and had to swim back to land and call the Coast Guard. The tide was quickly coming in, and none of us could figure out how to save the sweeper. We had to watch as it slowly went under. So, they had to get me a new sweeper." At this point in the story, John Garnham, who was standing nearby, joked that "We had to get his replacement sweeper COD." "When I got my new sweeper, people kept putting rubber ducks and lifesaving rings in the cab," Simon continued, amidst laughter and nods all around. "I'm still paying for that one. I don't get paid anymore, it all goes straight to the lorrie. Seven days a week I'm workin'."